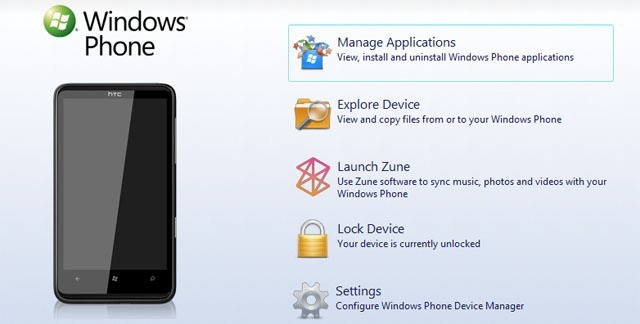 A new player is about to enter the world of Windows Phone 7 jailbreaking according to news blog Winrumors.com. Developer Julien Schapman claims in an email sent to the site that he has created a new way to hack the fledgling OS to enable unlocking, application side loading and other hackery goodness. He expects to launch the Device Manager after Microsoft’s upcoming OS update, expected some time in February. ChevronWP7 was the original jailbreak tool that worked by making the handset believe it was a development device by making it check the application for authorization instead of Microsoft’s servers. The problem though, was that Windows Phone 7 handsets ‘phoned home’ every two weeks. When that happened, the developer license was revoked. This left people having to pay the $99 for a legitimate developer account. The beauty of Schapman’s app is that this limitation is no longer there, making it a much better proposition for Windows Phone 7 users who just want a little more control over their hardware. Something iPhone owners know all about! Microsoft already has plans to plug the whole ChevronWP7 uses with Microsoft’s Brandon Watson confirming that ChevronWP7 will no longer function in future. “Yes, the hole ChervonWP7 team found is closed,” claimed Watson. With that in mind, it makes perfect sense for Schapman to hold off releasing his app until after the February OS update. All this is good news for Windows Phone 7 users of course. More people joining the jailbreak scene clearly shows there’s life in the platform that many thought would never recover from the debacle that was version 6.5. Version 7 could just turn out to be Microsoft’s mobile savior! Now, which handset do I get?